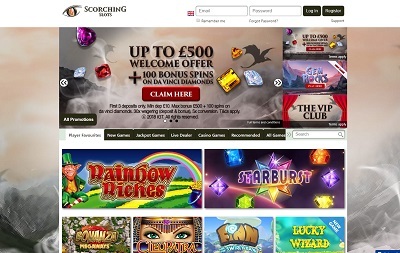 Scorching Slots casino is licensed by the UK Gambling Commission and the Gibraltar Gambling Commission and offer 24/7 support via e-mail, and 16-hour support via live chat and telephone. 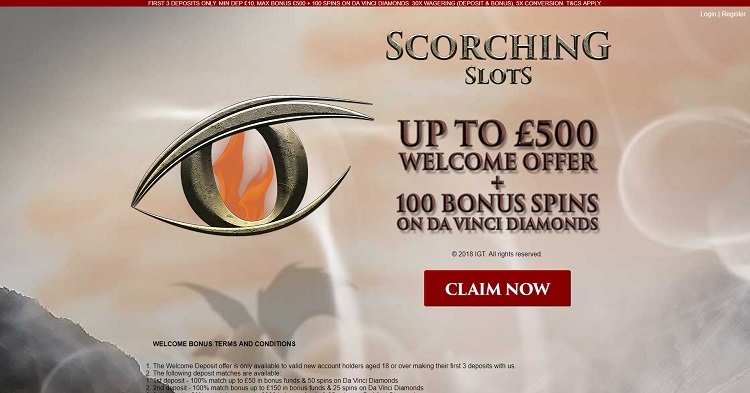 For those of you who’ve played on Pots of Luck and Kerching Casino, you may feel a little bit of de ja vu when you land on Scorching Slots’ casino. Why is that? Well, it’s because the layout is exactly the same across all three casinos. It’s kind of unmistakable, really; big image at the top, three smaller images to the right, and the rounded, bevelled category buttons below. Yep, you’ve seen it all before. But hey, that’s not a bad thing. There’s a reason why more than one casino uses this layout, it’s because it works so perfectly. 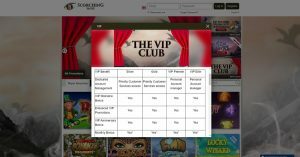 Everything’s easy to find as soon as you land on the page, plus there’s no waiting time for anything to load, and though Scorching Slots pride themselves on being a mobile casino, their website works brilliantly across all devices. The minimum withdrawal is £20 and the minimum deposit amount is £10. The maximum deposit limit is £7,000 per transaction and the withdrawal limit is £2,000 per day. Right, right, right. We have a lovely little selection here. We have a little bit of Monica in our life, a little bit Erica by our side…nope, sorry, games, that’s what we’re on about. Well, we have a little bit of jackpot games in our life, a little bit of table games by our side, a little bit of live dealer’s all I need, a little bit of slot games is what I see. A little bit of…ah nah, that’s it. In terms of what’s in the categories, the offering isn’t bad, but not fantastic either. 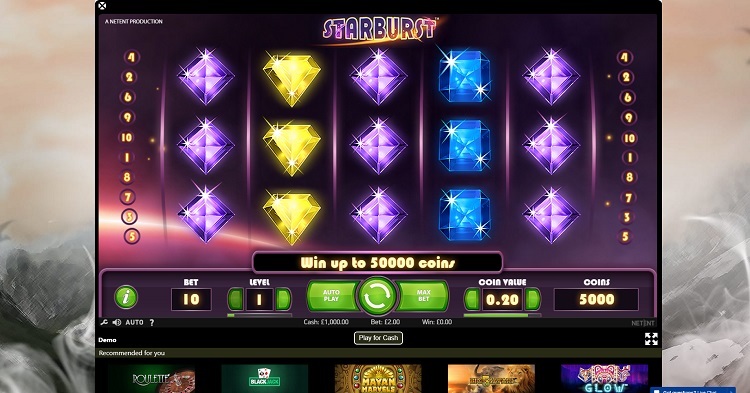 There’s no millionaire-making Mega Moolah and Mega Fortune in the jackpot selection, which is always a disappointment, plus there aren’t too many NetEnt games in the slots category, and that saddens me too because I bloody love NetEnt games. 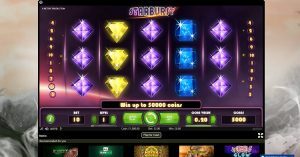 Though, hey, I can’t be too harsh, there are over 500 games to choose from and you do get the likes of Cleopatra, Rainbow Riches and Starburst to sink your teeth into as well. Tasty! What we saying then? What we saying about this geezer? Well, I want to be honest and just say, if you’ve played at Kerching Casino and Pots of Luck then you’ve seen this all before. If you like their casinos, you’ll love this one. And it’s as simple as that. So why play at Scorching Slots if you’ve played with the other guys and girls? 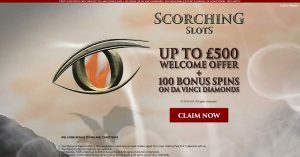 Well, the welcome bonus is one reason – £500 right into your account + 100 bonus spins is nothing to be sniffed at, and though the skin of this casino is the same as Kerching and Pots of Luck, underneath the surface there are big differences like the game library which is completely different from casino to casino. And that’s why you play at different casinos, isn’t it? To experience new games and to find new bonuses! Scorching Slots may look like a couple of the other stormtroopers out there, but he has its own mind and his own personality. Don’t dismiss the chap on his uniform alone.